There’s no better feeling than receiving a cheque from the tax man. But with Labor likely to win the next federal election, fewer cheques will be posted by the ATO. Will companies sitting on large franking balances rush out and try to beat the impending changes to the imputation system? Companies can release franking by three means; ordinary dividends, special dividends or off-market buy-backs. In this wire, we will concentrate the latter as we believe they are both more likely for the companies we discuss and relatively less understood by the average investor. What are off-market buy-backs and why are they so beneficial? The off-market buy-back is an almost uniquely Australian phenomenon. It allows companies to release franking credits, maintain preferred capital structure and increase earnings per share all in one hit. The first off-market buy-back was conducted by CBA in November 1997 returning $650m of capital and $165m in franking. Although quite rare in the early years, off-market buy-backs exploded in popularity post the change to imputation laws in 2000, which allowed the refund of franking credits to those with tax rates less than 30%. With the current opposition’s plan to reverse this change effective 1 July 2019, we believe those companies that are in the position to return franking credits will do so imminently. The structure of an off-market buy-back allows investors to choose to sell their shares back to the company at a discount of up to 14% to their market value. This sale price is split into a capital component with the balance in the form of a fully franked dividend. Generally, the capital component is a small fraction of the buyback price, which means the rest is an enormous fully franked dividend. So, despite selling shares at a discount to their market value, when looking at the transaction including franking credits it may be advantageous, especially for those with low tax rates. For more detail on the mechanics of an off-market buy-back we have provided calculations for the most recently announced from BHP at the end of the article. 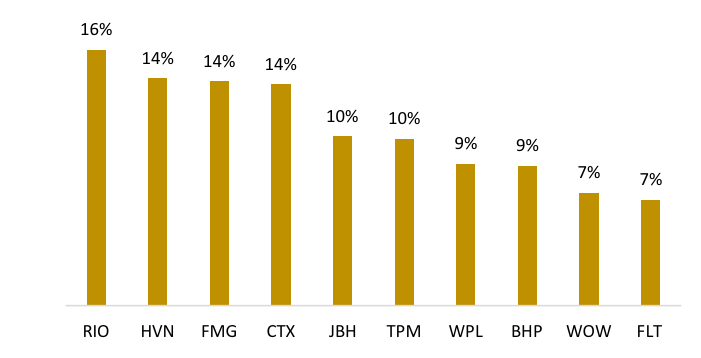 The following 10 companies stand out as the most likely candidates based on their large franking balances relative to their respective Australian market capitalisations. Source: Factset, Company Annual Reports*BHP & RIO franking balance adjusted for off market buybacks announced in September 2018 and November 2018 respectively. However, most of these companies are unlikley to do an off-market buy-back in the near term for the following reasons. BHP Billiton (BHP) – Gearing sits within its target range (US$10 to US$15 billion net debt) after the current off-market buy-back. There may be another small off-market buy-back next year, but this is dependent on further asset sales. TPG Telecom (TPM) – FY19 gearing is at 2.2x net debt/EBITDA, which is above its medium-term target of 1.5 to 2.0x. Furthermore, over the next two years TPM will be spending significant capex (~A$900m pa) on its Australia and Singapore mobile network rollouts and associated spectrum and is therefore not able to return capital to shareholders. 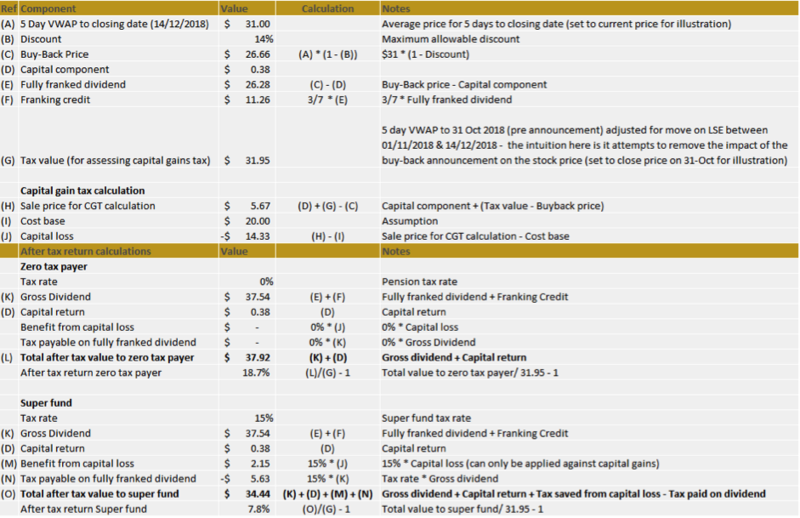 Woodside Petroleum (WPL) – Gearing looks relatively conservative and sits within its target net debt/net debt plus equity range of 10 to 30%. However, gearing will start to ramp up in FY20 as WPL develops the Scarborough gas resource in Western Australia. Caltex (CTX) – Caltex has a buy-back policy whereby off-market buy-backs are preferred, but only where net debt/EBITDA is less than 1.5x. Looking forward 12 months this ratio will likely be slightly above this level. JB Hi-Fi (JBH) – While its balance sheet isn’t stretched (FY19 Net Debt/EBITDA at ~0.75x) its fixed charge cover is in-line with other retailers at 2.9x. Further, given we are in the middle of a housing downturn it is prudent for cyclically exposed companies to be conservative. The following companies are all substantially held by founders (Harvey Norman - 33% Gerald Harvey, Flight Centre - 42% Geoff Harris, Bill James and Graham Turner, Fortescue Metals - 35% Andrew Forrest). You will recall that off-market buy-backs are beneficial for those with low tax rates which obviously excludes these individuals, so capital management from these companies are likely to be in the form of either special dividends or on-market buy-backs rather than off-market buybacks. Harvey Norman (HVN) – HVN recently raised equity to pay down debt (via a rights issue which breached listing rules, but that’s another story …). HVN’s balance sheet is strong with proforma FY19 net debt/EBITDA ratio just above 1x and fixed charge coverage at ~4x. Flight Centre (FLT)- Has the strongest balance sheet in our sample with a net cash position, however, when leases are considered its fixed charge cover is in line with other retailers at ~2.9x. Fortescue Metals (FMG) – Balance sheet is in a solid position with net debt/EBITDA at ~1x. Currently, FMG is in the middle of a A$500m on-market buy-back. Woolworths sold 540 fuel convenience sites last month to EG Group for A$1.725bn. This transaciton is subject to regulatory approval but should complete in early 2019. Back at their 2015 strategy day Woolworths disclosed that their maximum target net debt/EBITDA ratio is 2.7x (including leases). Based on this maximum gearing level and our FY19 estimates we believe the company will have ~A$1.5bn headroom and we expect roughly this amount to be returned via an off-market buy-back releasing over A$600m in franking credits. Despite buying back ~10% of its ASX listed register for ~A$2.9bn via an off-market buy-back last month, we think RIO will return in the new year with another, potentially even larger off-market buy-back. RIO has recently announced three asset sales totaling ~US4.5bn, the proceeds of which we expect will be returned to shareholders. The largest of these is its interest in the Grasberg mine in Indonesia worth US$3.5bn. While this is subject to a number of regulatory approvals it is expected to close in 1H19. The one caveat for RIO is there is talk that they may bid for a minority interest in Teck Resources’ copper assets in Chile. This could cost ~US$2bn which would reduce the value of the potential buy-back. We think the likely candidates to do an off-market buy-back (in order) are Woolworths followed by RIO. With the value of franking credits likely to fall for a significant cohort of investors mid next year we would encourage all companies with excess franking and under-geared balance sheets to release franking credits as soon as practicable. On the 1st November BHP announced a US$10.4 billion capital return program following the sale of its North American shale assets. The capital return is comprised equally of an off-market buy-back and a special dividend. As the buy-back period is yet to complete we have made a few assumptions, specifically the 5-day VWAP to the closing period, tax value and cost base. *Note in this case the capital component is so small that the deal is likely to benefit even higher tax payers due to the large value of the capital loss. ** Example based on shares tendered and accepted. Scale backs will apply and will likely be very high for BHP (probably >90%) given the low capital component and current share register. NOTE: We have made certain assumptions which will cause the actual outcome of the buyback to differ from our example. Investors should consult their financial adviser before deciding whether to participate in the buy-back. Great article, thanks for sharing your process and screening. Very interesting and pertinent in this economic cycle. Advisors do not seem to comment on these possibilities.